I was going to complain bitterly about the weather, the seemingly incessant rain more specifically. How the pots in our garden couldn’t cope with the deluge. The soaked coats and hair and the cold, don’t talk to me about the cold. Today though, I was greeted with a magnificent sunrise (no good pictures though) and my mood changed. I was going to spend the time complaining, but maybe it’s better to focus on the good things. :: Smallest girl turned three and was super excited to be a big girl and to have snow on her birthday. We all went outside and built a snowman in the meager snow. Then came a little party with all the grandparents and a cake. She was very happy to blow out her own candles too. And also the next day on her cake at nursery!! 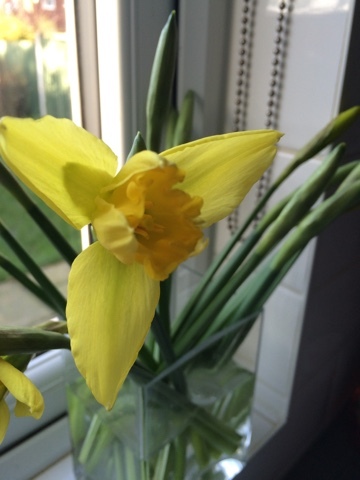 :: I bought the first bunch of daffodils of 2016. A bit of Cornish sunshine made me think of Leanne and they brightened the kitchen up no end. :: I splashed out on a new moisturiser as the cold had been playing havoc with my skin. My skin is very, very dry anyway and with the weather, drier still! Somehow a cleanser fell into the bag too. It was only a small size to see if it agreed with my skin and if I would keep it up. Just to set the record straight I do wash my face (!) but as I don't often wear make-up and have sensitive skin I don't use a 'soap' or make-up remover. One week down so far so good. I might need to go back and buy a bigger size of the cleanser and try to keep it up. 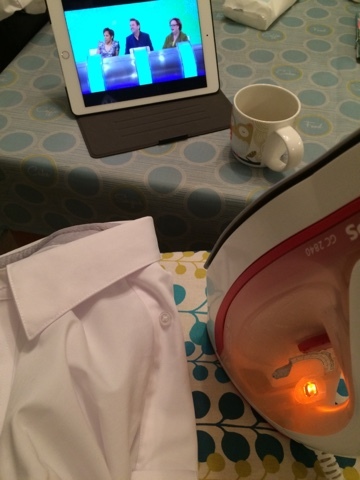 :: The girls played together nicely and I ‘enjoyed’ a bit of early morning ironing with ‘Would I lie to you’ on iplayer. :: A friend from work who I became close to when pregnant with our first children left for a new job. It’s a great move for her and her career. She’s moving to the dark side of the Pennines and taking up residence in Liverpool. I’m really going to miss her. BigR had a little cry when she knew her friend was leaving but the joke is we’ll probably see more of them now than when they lived round the corner! 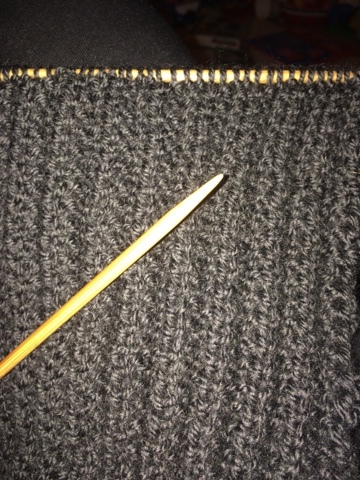 :: I’ve made (some) progress on a scarf for the ABO. As we’ve had such a mild winter so far he’s not needed it which is a good thing as I doubt if it’ll be ready until 2017! :: I found an old Cath Kidston voucher with £7 left on it and bought a new ‘fold-away’ bag to keep in my work bag for when I need another bag. :: I took LittleR’s old clothes to work for 2 friends who have girls who are a year younger than Littlest. Some of the ‘frocks’ were barely worn. It’s good to see them going to their new homes! :: I (finally) plucked up the courage to speak to my boss about my work (specifically one area of it) and if we could make any changes. I've not been happy with one aspect for a while. I'm a bit of a round peg in a square hole and although everyone is lovely, I'm not really achieving much or feeling like I'm doing a good job. For those not in the know, usually academics are ‘rated’ on their ability to be returned in the Research Excellence Framework. Basically this is how Universities are given their research funding – the quality of the outputs (research articles, grants, indicators of esteem (no I’m not sure either)) is judged and money given in return. Now on the horizon is the Teaching excellence framework due to be judged in a similar (metric) way and ultimately I believe will change how fees can be charged. I was returned with my department last time in the REF but due to changes within departments, the wider University and education more generally our department is unlikely to be returned which puts research academics into difficulty. You might want to be returned and work towards this goal but then the department isn’t returned as a whole (the story has to 'fit') so where does that leave you (and ultimately your job!)? There’s an option to change contracts to be more teaching focussed but in a Russell group University teaching is (still) sadly seen as the poor relation to research. So now I’m not sure where my role stands or what I want to do. I love the teaching part of my job but it’s a bit of a conundrum. :: I’ve been in the mood to clear stuff out (see above with children’s clothes). I did a bit of a KonMari style tidying and thought to see which of my clothes ‘sparked joy’. I’d seen her book a few times and the idea looked interesting. It was a bit of a weird undertaking for a Brit to see what I found joyful but I got rid quite a bit of ‘stuff’ including 3 pairs of coloured jeans which I used to like but now don’t. I have my ‘at home’ uniform of white t shirt, jeans/denim skirt, cardi (various colours), scarf. I keep getting ideas of stripes or spots or something but that might be too much pattern with scarf and cardi. Hmm. More food for thought. :: We went to the seaside, to Whitby. We walked on the beach even though the tide was coming in and had a treat of fish and chips in the Magpie Cafe then an ice cream on the pier (yes in January). It was such a lovely day with minimal moaning and arguing from the back seat of the car! :: I've been revisiting the (now very long) list of things I want to make. First seen here. I've still not done the applique blanket(s - now the littlest will want her own too) or the skirts (although I have the fabric and it's nearly spring!) or the photobooks. And I've added some extra things to it. First up is to finish the scarf (see above) and then I need to complete an embroidery for my friend's daughter. It was going to be a new baby present but then LittleR became ill and it got left by the wayside. Anyway it can be a first birthday present. Due for the end of February I think it's achievable and I'll share it here when it's done along with an updated long list. Thanks to everyone for their comments recently. I know I'm terribly behind again on emailing you and commenting on your blogs. I'll get there eventually. Aah the Cornish daff! The sun is shining here at the moment. I don't think we will have it for long though; the forecast is terrible for the rest of the week! This has put a smile on my rather grumpy face today. I've been wrestling with car insurance quotes (loathe it) and a general feeling of humbug and put upon. 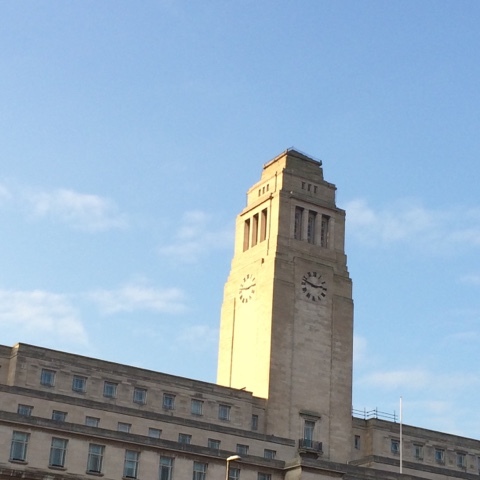 The Brotherton building always reminds me of happier, more carefree times when my waist was tiny, I went dancing most nights of the week and I didn't have worry about expired quotes and renewals! Happy birthday to your (not so)little girl. Three is a very good age indeed. It sounds like you've been having a good month so far. Your daffodil is so pretty. We don't have them here yet but I'm hoping they come soon because I really want some. Happy birthday to your little one! I hope she has a great year. I'm behind too! No need to apologise - life's so busy. I also have dry skin and prefer oils to creams, usually almond oil as a base with rose added. Brands-wise I find Clarins works, ditto Burt's Bees. Although budget dictates I blend my own concoctions at the moment. And I'm loathe to use many chemicals if I can help it. Although Diet Coke was a daily habit of mine when I worked in an office. 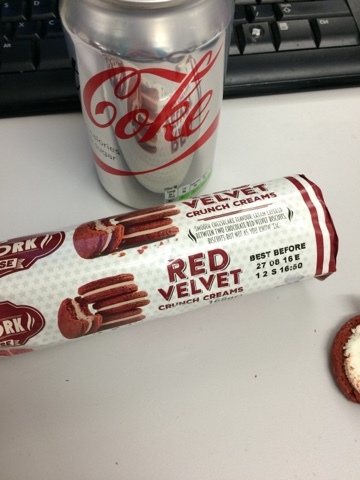 I'm a bit of a sucker for Oreos so I can only imagine what those red velvet biscuits are like *fights urge to go looking for them in the supermarket*. I've yet to bake a scone - must remedy that. And a belated Happy Birthday to your littlest. Three is both wonderful (for them and us) and sometimes maddening (just us).